Looking back at the Dunkerque fires: a personal perspective. It all began around 4.45pm. At the time, I was working in Refugee Community Kitchen’s Free Shops in La Linière camp in Grande-Synthe. Our team leader rushed into the container and locked the door, saying that a fight was kicking off directly outside. Five minutes later, the fight appeared to be over. We packed up and left as normal, and put it out of our minds. A couple of hours later, reports began to come through of a fight which had escalated. One of our Free Shops was on fire. A shelter was on fire. Several shelters were on fire. The camp is up in flames. The government run La Linière camp was home to 1500 people (officially), with the main groups being from Kurdistan and Afghanistan. The camp’s location was and still is a stronghold for Kurdish smuggler groups. 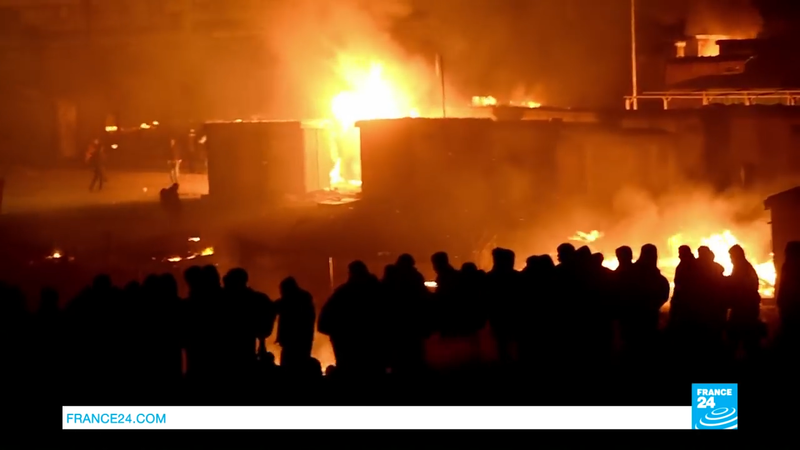 This led to tensions between the Kurdish and Afghan communities in the camp. Amongst other issues, Kurds had access to the good shelters, while many Afghans slept in the communal kitchens (which were never intended as sleeping areas). Towards the end, Afghans had to take it in shifts to sleep in the kitchens because there was not enough space, and many were also sleeping outside. In a government run camp, lest we forget. We were outside the camp by midnight, serving hot tea to people who had just lost their homes, belongings, community, documents. People were surprisingly cheery, or still in shock, but the mood was not low. Pack up your troubles and smile, smile, smile. Aside from one young man, who in attempting to run away from the fires, was struck by a truck on the motorway and killed. Barely a footnote in the news at the time, which focused on the violence of all those dangerous migrants without a moment to consider the conditions they were living in and the failures of the government as factors. But then, news reports never look at those things, do they? After one hour’s sleep we were back in the kitchen, cooking for 1800 people who at the time were scattered around emergency gymnasiums and in fields in the French countryside, who hadn’t eaten since the previous lunchtime, who were high on adrenaline and shock and trauma and nicotine. Refugee Community Kitchen fed every single person who needed food that day and subsequent night. The fire tore through the camp on the Monday. 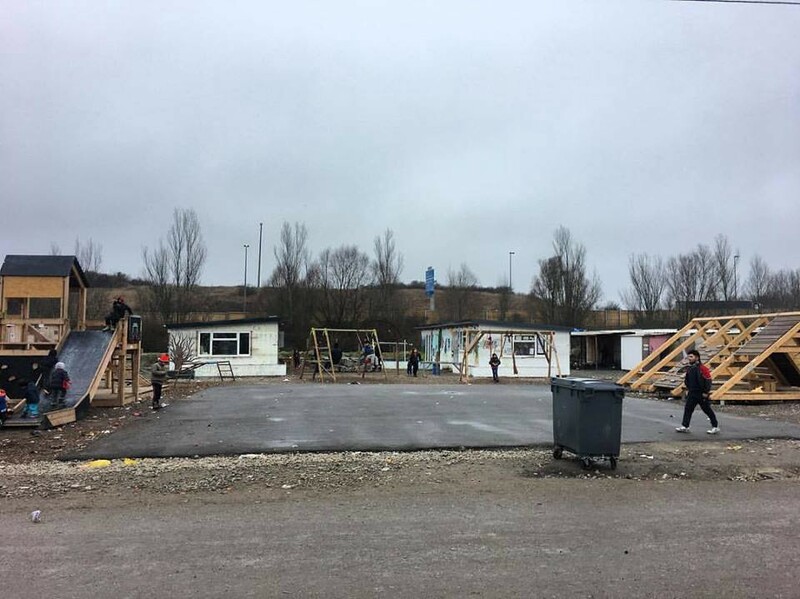 By Wednesday, it was clear that the camp would not be rebuilt and reopened, and that 1500 people who had some degree of state protection were to be turfed onto the streets. 140 Kurdish men, women and children gathered outside the gates of the former camp, surrounded by a barricade of police and CRS officers. What followed was nothing short of a shambles: orders had clearly been given to prevent distributions and the formation of people on and around the site of the camp, although with people already gathered there it was hard to ignore pleas for blankets and food. We managed to take some food to people at the gates, but not enough, and when we tried to return with more we were barred. The police then forced 140 men, women and children who had just lost what little they had to cross a busy road in order to get biscuits, and refused to help with the operation of stopping vehicles or ensuring people’s safety. A ridiculous operation all round, finishing off an intense few days which felt like a lifetime. One year on. There are still 1000 people sleeping rough in Calais and Grande-Synthe, many of whom lived in La Linière Camp. There are still deaths on motorways, with devastating regularity. There are still enormous inadequacies in how the government deals with its obligations, such as sanitation, healthcare, information and food. Volunteers are still being punished for helping people. There are still no roofs over people’s heads. And the Warehouse still keeps on working in Calais and Dunkerque. To get involved and volunteer, donate or fundraise visit Help Refugees website. News and Stories from the organisations working on the ground for Refugees in Calais, France.